Welcome to the PAX Community Discord website! With so much happening in this awesome community, we thought that having a convenient site to congregate all of the important information and updates regarding the server would be highly beneficial for everyone. Now then— HERE’S A QUICK RUNDOWN! You can use the Events tab to keep track of upcoming… erm… events? My sources are telling me that the events tab is in fact meant for events! Game Nights, Adventurers League, Official PAX events, and more can all be found here. The Blog tab is where you get to read about our deepest and darkest secrets, such as Andeh’s favorite person on the serv-… I mean, useful updates. Yeah, those. You’ll find server updates, alongside various other posts being made here occasionally. MERCH! Quite limited right now. Currently, you will find a place to get your pins and badges (although they’re not open quite yet!). We have lots of plans on the way… so stay tuned! Now that that’s out of the way, a few more updates and news for those of you who decided to come check out the site and get this far in the reading! PAX West is right around the corner; more specifically, the badge sale. We will be waiting to begin PAXter Pin orders and PCD Badge reservations until after the sale takes place. Speaaaaking of PAXter pins, they’re getting a fancy overhaul. 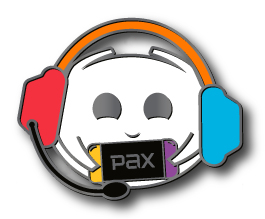 We appreciate everyone who ordered the OG PAXter pins, and we hope you love them as much as we do; however, like with most other things around here, we’re always looking to improve! After pulling some strings, we have a proof to show off to you today of the PAXter 2.0 pin! You can probably see some immediate changes (slams upgrade button). The pin will sport a flatter design, with nice, shiny dyed nickel outlines/accents, as well as cutouts near the headset strap and microphone. Similar to newer official Pinny Arcade pins, it will also feature two clutches on the backside to keep the pin nice and straight, as this pin is a tad larger than the original. We managed to cram all these little quality-of-life upgrades into this cute little pin, and are proud to be able to bring them to you for only $4 each; a mere 50 cent premium over the original. With all proceeds going directly into manufacturing, we’re able to keep the cost lower than most pins you’ll find elsewhere, so we hope the small price jump isn’t an issue for most members! If you find yourself extra adventurous, you can check out the merch area of the site to get a glimpse at the new backcard they’ll come on, too! That wraps up this hefty introductory post. Thanks to all of our community members for making all of these things possible. See you in the next update.